Paddy Purser of ProSilva Ireland presented ithe organisations principles on the popular Ear to the Ground program produced by Agtel for viewing on Irish television. The Photo to the right shows Paddy Purser during one of the interviews. 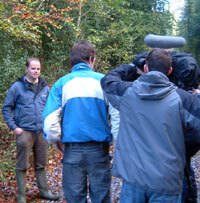 Other interviewees included Huw Denman, who is a Near To Nature Forestry expert from Wales. The program was considered a success and although short, our message was clear.